The following is an excerpt from Barton Bigg’s book, Hedgehogging, where he relates a conversation with “Tim”, a successful macro investor (emphasis mine). What separates the great traders from those who are just good? The answer is knowing when to size up and eat the whole hog. To become a good trader you have to master risk management. Managing risk is the foundation of successful speculation. It’s the core of ensuring your long-term survival. Risk and trade management are absolute critical skills to becoming a good trader. All good traders are masters in these two areas. But the thing that makes great traders head and shoulders above the rest, is the skill in knowing when to go for the jugular. In sizing up and aggressively going for Totis Porcis, the full hog. Great traders know how to exploit fat tail events — the large mispricings that only come around once in a blue moon. They swing for the fences when fat pitches come across their plate. Examples of this are Livermore making a fortune shorting the 29’ crash. PTJ doing the same in the 87’ rout and the Nikkei fallout in 1990. Druck and Soros when they took down the Bank of England in 92’. Buffett, who’s a master of exploiting fat tails, did it when he put nearly half his capital into AXP when it was selling for dirt cheap prices. This is something we at MO call FET which is just short for Fat-tail Exploitation Theory. Markets and investor returns follow a power law. Similar to Pareto’s law, returns adhere to an extreme distribution of 90/10. This means, that amongst great traders and investors, 90% of their profits on average come from only 10% or less of their trades. Some years ago in my observation of P/L patterns, I noticed the following interesting trend: For virtually every account I encountered, the overwhelming majority of profitability was concentrated in a handful of trades. Once this pattern became clear to me, I decided to test the hypothesis across a large sample of portfolio managers for whom transactions-level data was available. Specifically, I took each transaction in every account and ranked them in descending order by profitability. I then went to the top of the list of trades and started adding the profits for each transaction until the total was equal to the overall profitability of the account. What I found reinforced this hypothesis in surprisingly unambiguous terms. For nearly every account in our sample, the top 10% of all transactions ranked by profitability accounted for 100% or more of the P/L for the account. In many cases, the 100% threshold was crossed at 5% or lower. Moreover, this pattern repeated itself consistently across trading styles, asset classes, instrument classes, and market conditions. This is an important concept that has far reaching implications for portfolio management, many of which I will attempt to address here. To begin with, if we accept the notion that the entire profitability of your account will be captured in, say, the top 10% of your trades, then it follows by definition that the other 90% are a break-even proposition. Think about this for a moment: Literally 9 out of every 10 of your trades are likely to aggregate to produce profits of exactly zero. And here’s where we get to the crux of the matter. Good traders don’t know how to harness this power law. While great traders do. They exploit it, using it to their full advantage. But how can one be a pig while still being a good manager of risk. It kind of seems like a paradoxical statement doesn’t it? Your average trader picks trades that have symmetrical potential outcomes. This means that the market pricing is on average, correct. It’s efficient. And the distribution of returns for these trades will fall randomly within the cone of future possibilities. On average, these trades don’t produce alpha. Using trade and risk management, a good trader can take this symmetric futures cone and produce positive returns by reducing the downside of return outcomes through trade structure and stop losses. 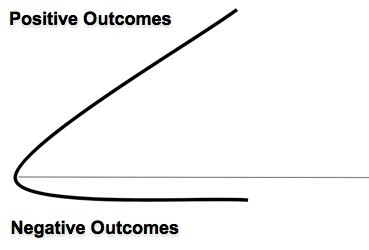 But their upside is limited to the average distribution of outcomes. But great traders and investors are different. They are skilled at identifying highly asymmetric outcomes. These trades have the potential to massively reprice in their favor. The distribution of future outcomes for these trades looks more like this. And not only are they skilled at identifying these skewed setups but when all the stars align they go for the whole hog and exploit the market’s error. They know that these rare asymmetric opportunities don’t come around often. Great traders have this ability not because they are any better at predicting the future. Prediction is a fool’s errand. It’s because they have built up a store of knowledge and context and pattern recognition skills. This allows them to more effectively assess the range of possibilities for an outcome set and identify one’s that are highly skewed to the upside. They have the experience base that allows them to aggressively size up while at the sametime properly manage their risk. Simply put, they’ve earned the right to have conviction. And the vast majority of good traders haven’t earned this right. So they’re better off sticking with consistent and manageable bet sizing. The evolutionary process of a trader should be to focus on mastering risk management. Then trade management — riding winners to their full potential. All the while building up a library of experience and useful context that will give them tools to identify asymmetric opportunities down the road. And once they’ve earned the right to have conviction, they can go for Totis Porcis. Until then, “stay close to shore”. Some final words from Druckenmiller. The way to build superior long-term returns is through preservation of capital and home runs…When you have tremendous conviction on a trade, you have to go for the jugular. It takes courage to be a pig.